All individual stocks were purchased without any asset allocation consideration, therefore, including these stocks will greatly skew the result. So instead, I decide to focus on the part that I have full control. What I used in the past to determine the asset allocation of our mutual fund investments is a free total from Morningstar.com called Instant X-Ray. To use the tool to do the analysis, all I need to input are the fund’s symbol and its market value at the moment for every fund. Then the X-Ray will display the allocation in an easy-to-read pie chart. Even though each fund has a investment style, such as large-cap value or mid-cap growth, the fund’s style itself can’t be used directly to determine the allocation of a portfolio because each fund contains many, possibly hundreds (for example an index fund that tracks the S&P 500) or even thousands (such as a total market fund), individual stocks that belong to different categories. 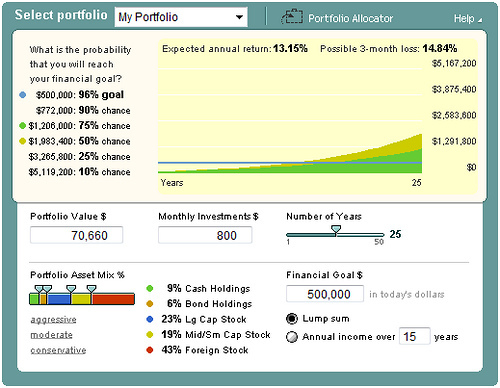 Therefore, a tool like Instant X-Ray is needed to get a complete view of the asset allocation of the portfolio. While Instant X-Ray is easy to use, there isn’t much insight of the result such as what I can achieve if I maintain the allocation and the current contribution level or what will happen if I change the allocation to a different target. To get a better understanding of our portfolio, I recently started to play with a premium tool from Morningstar called Asset Allocator. One of the most significant difference between Instant X-Ray and Asset Allocator is how the data is entered. With Instant X-Ray, only the ticker symbol and market value of a fund are needed. With Asset Allocator, a portfolio is actually has to be built with all the transactions, if any, not the overall value. 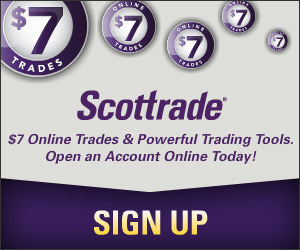 Fortunately, I don’t really have to enter every transaction manually (that would take a long, long time to complete since my first investments started in 2001). The Asset Allocator can import portfolio that was previous built with Excel, Intuit Quicken, MS Money, Money.com, Quicken.com or Yahoo! Finance. In my case, I just exported the transactions from Quicken into a .QIF file first (I have been using Quicken to track our investments from day one), then imported them to Asset Allocator to rebuild a transaction portfolio. Since the Quicken file contains investments that are no longer active at this moment (I have gotten rid of some funds that didn’t fit my investment goal any more), the Asset Allocator allows me to decide which funds I want to import so I don’t include any information that is obsolete. After the selection, the portfolio can be viewed with only those funds I am investing into right now and the entire transaction history of each fund. The next step is to use the portfolio, with the current asset allocation, to do some analysis (this the feature that isn’t available with Instant X-Ray). 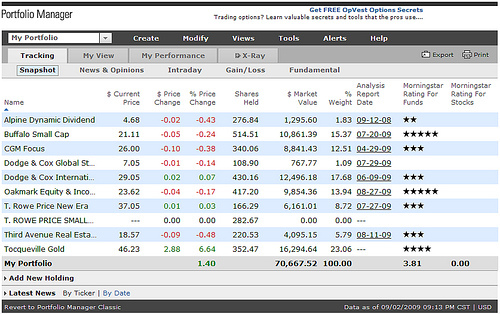 Right now, I am setting aside $800 each month for our mutual fund investments, roughly $100 for each fund. If I maintain this level of monthly contribution, which I think I will unless somethings extraordinary happens, and my goal is to have, for example, half a million dollars in this portfolio by the time I retire, can I reach my goal if I keep the allocation intact, which overwhelmingly favors stocks over bonds (43% in foreign stock, 42% in domestic stock, 9% in cash and 6% in bond)? Well, according to the Asset Allocator, I have a 96% chance of reaching my goal in 25 years and a 50% chance of getting close to $2 million at the end of the same time period. The chance of reaching the goal decreased to 70% if I shortened the time span to 15 years from 25. Though I like my chance of success, there are a few observations from this prediction that make me feel it’s still a tough goal to reach. First, the result seems to be based on the expected annual return at 13.15%, which is pretty high in my opinion. The source of this kind of return is, I guess, my preference of investing in foreign stocks over domestic equities. As the asset allocation at the bottom of the above picture shows, with this portfolio, I currently have 43% invested in foreign stocks with the core holding being Dodge & Cox International Stock (DODFX), along with a couple of other funds which invest a significant portion of their assets in foreign stocks. International stocks have performed very well in the past, but they also took a much harder hit during the financial crisis (thinking about China for instance). Going forward, I will likely reduce our investments in foreign stocks to about 35%, which could have some impact on the expected annual return. Second, as I mentioned before, I don’t have any bond funds in taxable account, though I buy I-Bonds regularly. The one lesson can be learned from the 40% loss of the broad stock market last year is investing conservatively can save the portfolio from being ruined by a severe short-turn downturn. I certainly don’t want to lose half of my investments in one year when I don’t work any more though I can tolerate it now. So, as time goes by, I will need to adjust the allocation to hold more bonds than 6%. This will in turn reduce the expected annual return. And predicting the future result based on current investments isn’t the only function of the Asset Allocator. 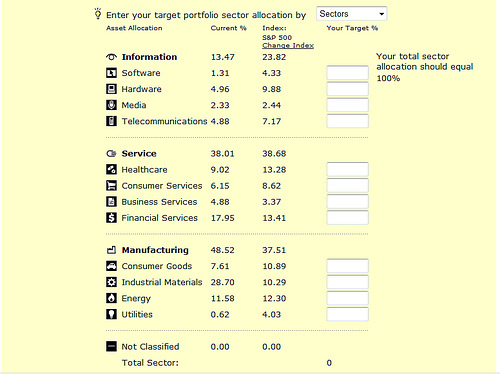 It also let me change the target allocation of each category and investment style and see different results. It even goes into such details as setting target allocations for sectors as compared to the S&P 500 Index (or any other benchmark). Obviously, updating the sector allocations involves more than just putting in the numbers because figuring out exactly how much to invest in each sector that makes sense requires, I think, a clear understanding of the sector, its portion in the economy, and the growth potential, etc. So instead of trying something that’s far away from reality, I think it’s better to let the portfolio’s sector allocation resemble the a benchmark such as the S&P 500 or Russell 2000. In my experiment, I decided to use the S&P 500 as a reference. As the above screenshot shows, my current portfolio has too much in the manufacturing sector (particularly more in industrial material and less in utilities) but not enough investments in the information technology. Since the sector allocation of the portfolio comes from all the funds, it’s not straightforward to say which fund holding needs to be adjusted in order to meet the overall sector allocation target.